Happy New Year and welcome to another month of The Book Club Cook Book Cooking Crew! This month, Sarah from The Pajama Chef is hosting and has chosen Peace Like a River as this month's book! Each month, a new blogger hosts and chooses a book for us to make recipes inspired by the book. Please see her invitation post for more information. This month's book, Peace Like a River, was a new book to me. It's about a family's faith and their family's test of hope and family. The story is told through the eyes of 11-year old, Reuben, who came into life by the miraculous hands of his father, who continues to display small miracles-- like a small pot of soup that never dries up, walking on air, and a vehicle that continuously runs on vapors. The family is tested though when his brother is in jail and subsequently escapes. I won't go into more in hopes that you'll read this book; it's a beautifully told story. I decided to make a peach pie for my selection this month, which is inspired by the peach pie the children ate at the lawyer's house before Reuben's brother's trial. When looking for a recipe, I had two options-- one that my mom makes and another from a new favorite cookbook though a recipe I've never tried. Because of the story takes place in the 1960's, I decided to use the recipe my mom uses. This recipe comes from my dad's mom's cookbook (this is the only thing I have of my grandma's), which was Betty Crocker's Picture Cook Book and was published in 1950-- I figured the pie they ate was probably something close to this one. This pie is delicious in its simplicity; it's easy to make and it always a pleaser. My mom's been making versions of this pie for years-- plum, apricot, peach-- and it always comes out amazing! Line a pie plate with one of the pie crusts. Mix together the sugar, flour, and cinnamon. Lightly mix the sliced peaches into the sugar mixture, then pour the mixture into the prepared pastry-lined pie pan. Dot with the diced pieces of butter. Cover the pie with the second pie crust, taking off excess overhang, then press and crimp the edges. With a sharp knife, make slices into the top of the crust so that the steam can escape. Bake pie 35-45 minutes until crust is nicely browned and juices begin to bubble through the slits in the crust. Serve slightly warm, not hot. That looks fantastic, Renee! Now I want pie!! Great minds Renee. It was the peach pie that grabbed my attention as well. What a great looking pie! I love the thick filling and the thick crust. I want a big slice of pie for breakfast now. 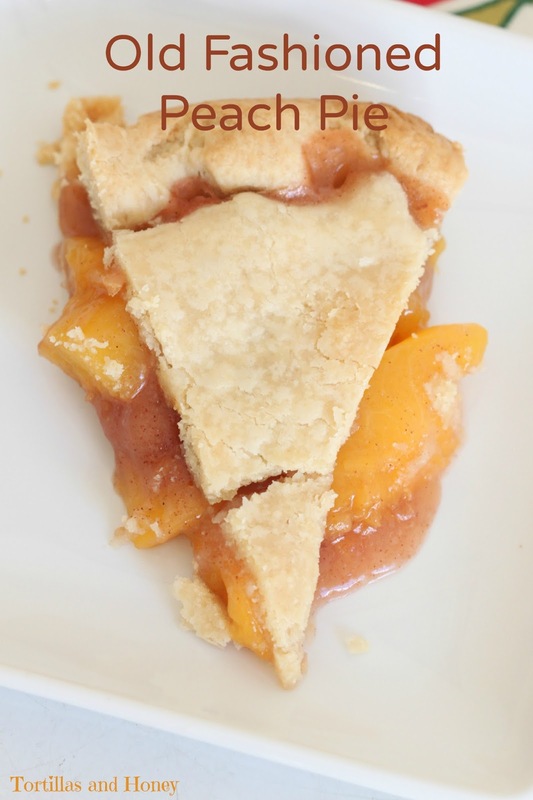 this peach pie looks wonderful! my sister used to work in a bakery & they always used frozen peaches for their peach pie so that's a great tip to include in the recipe. You made one of my favorite pies Renee' and made it picture perfect! Hope you saved me a piece.